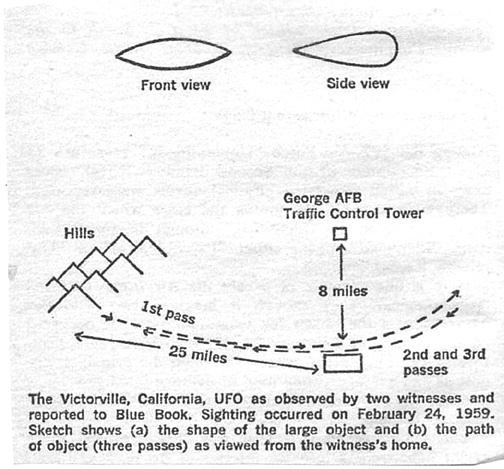 The Hynek UFO Report, by J. Allen Hynek, 1977, Dell publishing, New York, pages 167-170. The young man’s attention was first captured by a bright light shining into the interior of his darkened bedroom. It was a bright, white steady light which was reflected against the wall opposite his bedroom window. He realized that it was much too intense to be the headlights of a car. As his parents were at night school and he was in charge of the house and his younger brother, he got out of bed, dressed, and went out on the front porch of the house to see where the light was coming from. Also, the family’s pet dogs had by this time commenced to howl and run around as if terrified, and he wanted to let them into the house. He first sighted the object in a due westerly direction, at an elevation of about twenty degrees, but at an undetermined distance. It resembled an elongated egg (see sketch), about 156 feet in length [derived from the boy’s statement that the object was slightly larger, top to bottom, than his hand spread (7.5 inches) at arm’s length (27 inches) when at a distance of about 80 feet]. The object was about twice as long as it was thick. Despite its brightness, the object had a dull red color with purple waves coursing through its extremities. It emitted a sound which was described as similar to the hum of a large transformer, but higher in pitch; or similar to, but vastly greater in volume from, a whip swishing through the air. The object came toward him, its first approach lasting about ten seconds. It flew directly toward his house, on a steadily declining altitude of approach, and passed over his front yard at an altitude of about eight to ten feet. It then veered gradually to the northeast. Oddly enough, he could hear the object only while he could see it. Even odder, the boy was puzzled at his inability to see the object from the rear, when this should have been possible. He went back into the house to calm his younger brother and the dogs. When he went outside again, after five minutes, he observed the object due west of the house and once again approaching him. It appeared that this time the object would pass closer to the house; by now truly frightened, he went back into the house to get a gun. But as the object sped past the house he lost his opportunity to use it. It was at this point that his younger brother saw the object through the front living-room window, which was covered by a split bamboo blind. About five minutes later the boy went outside again and once more observed the object to the west of his position, but this time approaching at a high speed. He re-entered the house as the object sped past. Twice more the object passed directly over the house, the last time some fifteen minutes after the first pass. By the last approach, the vibration of the object could be felt throughout the house. In addition to the disturbance of the animals, it was reported that the radio, which had had very clear reception until then, was completely blocked by intense static. The static on the radio was not evident before 10:00 P.M. nor after 10:15 P.M., which seems to indicate that some electrical or magnetic disturbance was present in the immediate area during that time. The witness further stated that each time the object passed overhead he could hear a very sharp cracking noise which he compared with the spark gap of an automobile spark plug, but of greater volume and intensity. He was emphatic that this noise was not that of a sonic boom, which he had heard many times previously. When his parents arrived home at approximately 11:00 P.M. the incident was over; but the family pets were still whimpering and shaking and hiding under the furniture. Two neighbors living in the area were questioned separately and admitted that at “about that time,” they also experienced severe radio and television interference. They would not, however, give any details nor did they give the reporting officer permission to use their names. The figure on p. 168, is scanned in separately.